Guitar Techniques September 2005 PDF and Mp3 CD complete issue, cover to cover. 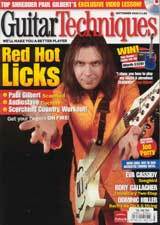 Take the UK’s foremost guitar teachers and players, and transfer their finesse and passion for music into a magazine! The magazine has established itself with guitarists who wish to better themselves as musicians in both the UK, Europe and as far afield as the USA and Hong Kong! When it comes to choosing music, GT’s Abba to Zappa policy means that there’s always something for everyone! Future Music brings you the most in-depth news and reviews from respected industry professionals. We’ll also give you all the advice you need to get the most from your current set-up, and interviews with musicians at the cutting-edge of technology. Paul Gilbert: Scarified – Guthrie Govan transcribes it for you and Mister Gilbert himself plays it. What a team! Only in GT! Rory Gallagher: Unmilitary Two-Step – A fantastic acoustic blues track transcribed by Jamie Humphries come with bells and whistles! Competition: Ibanez/Laney set-up – Just answer one simple question and 528’s pounds worth of Ibanez guitar and Laney amp could be yours! Joe Perry – Aerosmith’s guitarist on his first solo album in over 20 years, and what makes him tick. One-to-one with Dominic Miller & Paul Gilbert – Dominic performs Bach’s Air On A G String and Paul Gilbert plays extracts from his amazing shred fest, Scarified! Big fan of Paul Gilbert! Thanks for the share! Has anyone got video from this issue?